One of the newer websites out there right now that I’m fairly fond of is Quora. It’s really turning into a useful website full of great questions and answers from very knowledgeable contributors. One post that I recently stumbled on: “What’s something a reasonably smart person likely doesn’t know but would find incredibly useful?” was particularly insightful. It contained a bunch of useful hacks folks could implement to recycle things around the house to use for other purposes. I’m sure some of you have heard of these – but I tried to include items that I’ve never used before. If you know of any others – I’d love to hear about them! I love this idea. Very clever use for those old CD / DVD spindles that you’ll toss in the recycling or garbage after creating your music mixes for friends and family (people still do this?? anyone?). 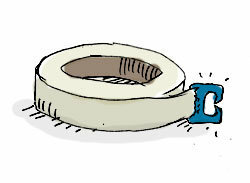 This should keep a tight seal and will cause your sandwich to be fresh and ready to eat come lunchtime! P.S. – Also great for doughnuts. I’m not sure there are many things more perturbing than trying to get at the end of some tape that is stuck to the roll. Well, I can think of one thing: getting at a fresh sheet of toilet paper! Use any old tab from a bag of bread and tape it to the end of your tape roll for easy access the next time you need to wrap that gift or mail that package off to grandma. Ever have a hard time getting equal pieces out of that birthday cake? Well, your worries are over with this gem. 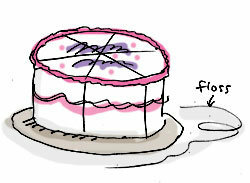 Try unscented floss to create perfect slices in cake, cheese and other delicacies. I’m not sure I would reuse an old piece – but perhaps if you washed it out real good, rinsed – then disinfected it? Eee. I’d be interested to know if anyone has tried this one. Having owned an iPod and now an iPhone, there are lots of ways you can accessorize the thing(s). From covers to apps and ringtones, lots of folks are making money from the devices. 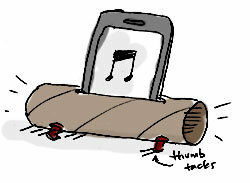 But, you don’t have to give ’em any of your hard-earned cash with this cardboard roll, turned iPhone/iPod speaker! Simply cut a narrow opening in the middle of the roll large enough to insert your device, then stabilize the roll with some thumb tacks. 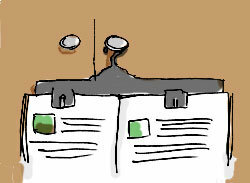 Struggling to keep that page of the cookbook open while you prepare dinner for your loved ones? Or, perhaps you are wanting to finish reading that article from the latest issue of Martha Stewart’s Living. Easy recycling trick here is to grab an old pants hanger from the closet and snap the clips right to the book or magazine to keep er open. 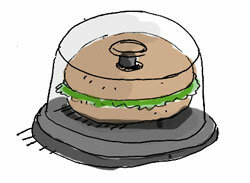 Love the cd case–now bagel holder idea. When I was growing up we used the floss to cut cinnamon roll dough, just slide it under your roll of dough, cross the ends and pull cutting through the dough. Works for cutting cookie dough too! The bagel sandwich tote is brilliant. I might have to do that (with donuts, though). @Ruser – Used cloth diapers? Eew – not sure about that!